Recognizing and understanding spatial subsidies is necessary for effective conservation. As most examples in this article illustrate, there are frequent, strong interactions between often seemingly disconnected systems, with one habitat's influence often dominating the dynamics of the other over vast temporal and spatial scales. Besides the conservation benefits inherent in an increased understanding of nature, there are some very specific areas in which recognizing spatial subsidies at the aquatic-terrestrial interface will benefit conservation science. Siting decisions for areas of protection for threatened species or habitats will be greatly improved by integrating consideration of potential spatial subsidies into the decision-making process. For example, streams have traditionally been considered to be recipients, rather than sources, of trophic resources in terrestrial systems. Yet temperate forest herpetofauna have been shown to increase growth rates by as much as 700% through spatial subsidies arising from stream ecosystems. A better understanding of these functional linkages also illuminates questions about buffer zones and spatial scale of protected areas. 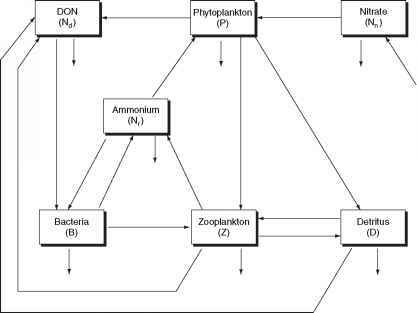 Studies of the effects of marine inputs on terrestrial ecosystems clearly demonstrate that it can be important to account for marine input to understand the dynamics of terrestrial systems. However, there is only inferential information regarding the distance offshore from which these resources originate. Fundamental questions are still unanswered about how far offshore one must protect a habitat to ensure adequate flow of allochthonous input. Nor is it clear how far inshore the effects of subsidies penetrate to impact terrestrial communities. An understanding of the spatial properties of these linkages will provide conservation biologists with better tools to protect threatened habitats and organisms. Efforts to establish effective marine protected areas will require a deep understanding of just how spatial subsidies between various marine habitats affect nearby (and distant) ecosystems.